Coming-of-age dramas are rarely as quietly perceptive and genuinely compassionate as the masterful new film Moonlight, which has garnered an overwhelming amount of acclaim since its debut at the Telluride Film Festival in September but it nonetheless justifies itself as one of the year’s defining achievements. Barry Jenkins previously directed the little-seen Medicine for Melancholy in 2008 and he reintroduces himself here as one of the most inspiring voices in American independent cinema working today. His handling of taboo subjects like race and sexuality among the seasons of a young man’s life represents a level of empathy and grace that should take hold of anyone who gives this film a chance. 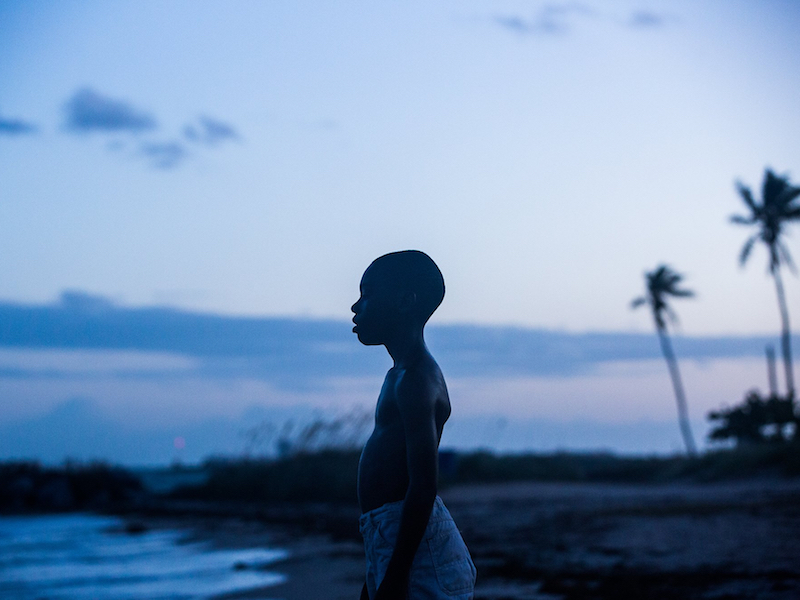 Based on the Tarell Alvin McCraney play In Moonlight Black Boys Look Blue, the story depicts three defining chapters in the life of our main character Chiron as he grows up in modern-day Miami. We are introduced to him as a young boy (played by Alex Hibbert) when he is discovered in an abandoned motel after school one day by a man named Juan (Mahershala Ali), who nicknames him “Little” due to both his diminutive stature and crippling bouts of shyness. Along with his girlfriend Teresa (Janelle Monáe), Juan does his best to take Little under his wing to make up for the emotional abuse he suffers under his drug-addicted mother Paula (Naomie Harris). Time passes and we witness Chiron as a teenager (played by Ashton Sanders) during a period of harassment by his school peers that causes him to confide in a classmate named Kevin (Jharrel Jerome), who shows Chiron the kindness that he’s been sorely neglected elsewhere in his life. When an unexpected act of violence sends Chiron to juvenile hall, he emerges years later as a hardened drug dealer played by Trevante Rhodes who now goes by the name “Black” (a nickname given to Chiron by Kevin in their teen years) and resides near Atlanta. Seeking to reconcile both with his mother and Kevin (now played by André Holland) after time lost to prison, he revisits his home town as a man who appears changed on the outside but still carries with him the formative memories of his past life. The screenplay, also by Jenkins, is remarkable not only for its pitch-perfect dialogue but even more so for the palpable subtext that permeates all of the words left unsaid between the characters. All of the actors, particularly Rhodes and Holland, are so carefully understated in their roles that there’s a kind of quiet electricity behind every interaction that kept me locked into the intimacy and urgency of every single scene. There’s also an incredible amount of physical and emotional consistency among the three performances for each iteration of Chiron, which would be a challenge for an actor to convey with any character but when it’s one as conflicted and guarded as the protagonist here, it makes the feat that much more admirable. On the technical side of things, the elegiac score by Nicholas Britell and James Laxton’s luminous cinematography add yet another layer of beauty and artistic accomplishment to a movie that’s already brimming with both. My only criticism lies with bits of sound editing and mixing that render some of the dialogue either inaudible or inarticulate, an issue I also had with the similarly heart-wrenching indie Krisha earlier this year. Other than that minor issue, Moonlight remains a staggering and unmissable meditation on what it means to find yourself amidst a potentially unwelcoming world and to fight valiantly for your own share of love and happiness.